GIANT PANDA, Change your name. the larger species Ailuropoda baconi lived . . . . Notices of most of these fossil finds were tucked away in obscure journals or were only briefly mentioned in catalogs of specimens recovered during American Museum of Natural History expeditions. From the known parts – especially the teeth – the fossil bears did not seem all that different from the modern pandas. Thanks to a single discovery, though, paleontologists have begun to piece together a better understanding of how these bears changed over time. 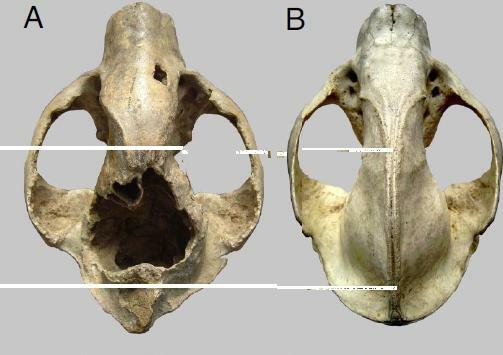 The fossil that has spurred several new studies into the origins of pandas. . . . (Modern Panda skulls are) not as heavily-built as that of the largest fossil panda, A. baconi, but it appeared that at least some unique giant panda traits were already present. . . and had just been tweaked a bit since then. A. baconi before a size reduction culminating in the modern A. melanoleuca.
. . . . . . . an evolutionary march of the pandas cannot be confirmed, (however a devolutionary path can be) and better sampling will be needed to tell whether all these fossil species represent a lineage as straight as a bamboo stem or whether there were splits which led species to overlap in time with each other.
. . . In order to survive, they have to eat heaping helpings of plant food to make up for their general lack of efficiency, and so they were adapted to have very strong jaw muscles to keep working through all that browse. . . . .
Of (these) potential fossil species, only two are known from relatively complete skulls, and the fossil teeth of Ailurarctos appear to indicate that the fossil lineage of giant pandas. . . . . and even the history of the more recent pandas is only partially known. In order to fill in those gaps, paleontologists will have to go back to the caves and fissures of Asia to uncover new clues.